#AskExcelinEd: How can states address the challenges of school turnaround? Three years into the ESSA era, the rubber has finally met the road. All 50 states and D.C. have approved plans, identified their first set of lowest-performing schools and are now undertaking the most difficult – and most important – task of all: school turnaround. To support states, ExcelinEd has partnered with the National Alliance for Public Charter Schools and Chiefs for Change to provide information on leveraging federal funds and promoting rigorous, evidence-based turnaround strategies. ExcelinEd is excited to release its first contribution from this partnership: School Interventions Under ESSA: Harnessing High-Performing Charter Operators. The brief reasons that states and districts can consider a wide variety of intervention strategies, such as replacing staff, improving curriculum and instruction and providing integrated student supports that address students’ health, emotional and behavioral needs. However, in districts where schools fail to turn around—or have already been failing for multiple years—states should consider the one option that can give students languishing in low-performing schools a higher-quality option: bringing in high-performing charter schools. 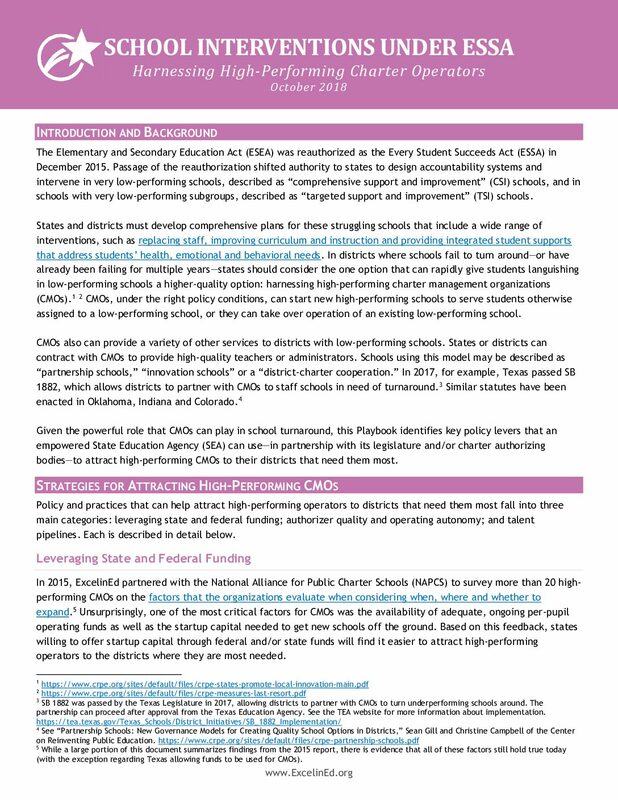 This brief also builds on our earlier findings, How to Recruit High-Performing Charter Management Organizations to a New Region, to highlight strategies states can use to attract high-quality CMOs to districts where schools are struggling the most. These strategies fall into three main categories: leveraging state and federal funding; authorizer quality and operating autonomy; and talent pipelines. We look forward to working with states as they address the challenge of school turnaround and ensuring their students receive a quality education. 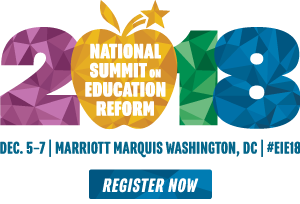 Join ExcelinEd on December 6 for the strategy session “Rising to the Challenge of School Turnaround” at the 2018 National Summit on Education Reform. You’ll learn how states can catalyze meaningful change for their students in low-performing schools by deploying federal funding, leveraging school choice and promoting high-quality instructional resources and effective vetting practices.